VALENCIA - In addition to the story of Marquez and Dovizioso, the #ValenciaGP is also treated with interesting dramas, including one when Jorge Lorenzo doesn’t like ordered by the Ducati team gave way to Dovizioso. When the race is very crucial to enter the last third of the round, Dovizioso who was held in fifth position should be given a way to get closer to the front row and increase the possibility to win. Ducati also clearly do what is called "team order". Until the race less 12 laps to go, Dovizioso stuck behind Lorenzo. The team gave Lorenzo orders, the same as in Malaysia, using the code "mapping 8". The code should appear on the Lorenzo’s dashboard. Not sure what the code means, but it is believed that the command to give Dovizioso way to be more open fight in front. But after the message came, until a few laps, Lorenzo still survive in fourth position in front of Dovi. The "Hard Code" was given again by the team from the information board for Lorenzo. The usual board used to inform the position and who the rider behind it finally was changed. 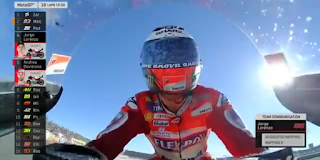 The lower part, commonly used to inform rider's name and time in the back, is replaced with a downward arrow, which means the command to go down one position, giving the path for Dovizioso. The order was still ignored by Lorenzo, until the race leaving six rounds. The incident was so fast, and Lorenzo finally slipped. Not long afterwards, Dovizioso also follow-up to make mistakes to fall in the corner of the eighth. Not yet known the cause of Lorenzo didn't give way Dovizioso. All will be known during a press conference, and worth awaited comments from the riders. Image property and widget of official Twitter of MotoGP™.